Source water is the untreated water in lakes and rivers, and in underground aquifers, that people use for drinking water. Source water protection means protecting our sources of drinking water from contamination or overuse. It is the first step to a multi‐barrier approach to protecting municipal drinking water (as seen in the image above) and often is the only line of defense for private drinking water supplies. Source water protection emerged as a result of the public inquiry following the contamination of the Walkerton drinking water supply in 2000. In May, the groundwater supplying the municipal well for Walkerton, Ontario became contaminated with E. coli. As a result of the failure of multiple protection measures, seven people died and thousands became ill after drinking the contaminated water. It was the catalyst for a public inquiry led by Justice Dennis O’Connor. Justice O’Connor made 121 recommendations to better protect sources of drinking water, including source water protection. Protecting our drinking water is not a one‐step process. The image on this page (above) shows Ontario’s multi‐barrier approach to protecting municipal drinking water “from source to tap”. Source water protection is the first step in this multi‐barrier approach, followed by effective water treatment, operator training, testing and distribution before the water reaches your tap. By ensuring that proper protection is in place at each stage of this process, the likelihood of water contamination is reduced. In response to Justice O’Connor’s recommendation for a multi‐barrier approach to providing safe drinking water, the Ontario government passed the Clean Water Act, 2006 and funded a drinking water source protection initiative, as well as strengthening existing legislation. The Clean Water Act focuses on protecting sources of drinking water for drinking water systems that provide drinking water to communities and certain types of residential buildings. The Act also allowed for some work to be put into increasing the awareness and protection of private drinking water wells that rely on regional groundwater sources. Under the Clean Water Act, 19 source protection areas or regions were established in Ontario to carry out drinking water source protection (including the Cataraqui Source Protection Area). 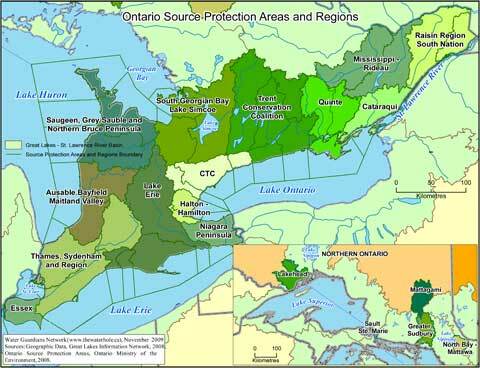 A map of the Ontario Source Protection Areas and Regions is shown to the right. Every source protection area or region has a source protection plan. The Clean Water Act established conservation authority jurisdictions as source protection areas. The boundary of the Cataraqui Source Protection Area is the same as that of the Cataraqui Region Conservation Authority, with the addition of the Township of Frontenac Islands. The Cataraqui Region Conservation Authority’s Board of Directors, known under the Clean Water Act as the “Source Protection Authority”, supported the formation of the Cataraqui Source Protection Committee. The Source Protection Committee led the technical and planning work necessary to put together the Cataraqui Source Protection Plan. Committee representation includes municipal, economic (including agriculture for the Cataraqui Source Protection Area), and other public interest sectors such as environmental organizations or cottagers/shoreline residents. One of the first tasks of the Cataraqui Source Protection Committee was to prepare a document called a terms of reference under the Clean Water Act, which identified the work plan for the source protection planning process, including research and planning, assigned roles and responsibilities, and established timelines and funding estimates. municipalities, and others to prepare an assessment report for the Cataraqui Source Protection Area. The Assessment Report identified areas where drinking water sources are vulnerable to contamination or overuse, and prioritized drinking water issues and drinking water threats within those vulnerable areas. The Assessment Report was prepared in accordance with detailed technical rules set out by the Ontario Ministry of the Environment and Climate Change. The report was approved by the Ontario Ministry of the Environment and Climate Change in 2011. The content of the Assessment Report was used to support the development of a Cataraqui Source Protection Plan. While working on the Assessment Report, a series of community roundtables were held to solicit early input from more than 250 local stakeholders in an effort to ensure local applicability at the earliest opportunity. In February 2012, a Draft Source Protection Plan was posted for review and comment. Public open houses were held to provide opportunities to learn more about the draft source protection plan and other source water protection topics. The Source Protection Committee requested input from municipalities, provincial ministries, First Nations, businesses, farmers, environmental interest groups, property owners, and the public. In June 2012, the proposed Cataraqui Source Protection Plan was submitted to the Minister of the Environment and Climate Change for review. The Cataraqui Source Protection Plan (the Plan) is a locally developed plan of action to keep sources of drinking water clean and plentiful. The Plan includes requirements or recommendations to reduce the risk of pollution near drinking water supplies. The Cataraqui Source Protection Plan focuses on protecting sources of drinking water for systems that provide drinking water to communities and certain types of residential buildings (also known as municipal residential drinking water supplies), and also includes policies for the entire Cataraqui Source Protection Area where the groundwater is vulnerable to contamination or overuse. The Cataraqui Source Protection Plan received approval from the Minister of the Environment and Climate Change, the Honourable Glen Murray, on November 26, 2014.
implementing bodies, including municipalities, local health units, provincial ministries, the Cataraqui Region Conservation Authority, businesses, and others. Resources to assist with implementation needs have been put together by Cataraqui Region Conservation Authority staff.